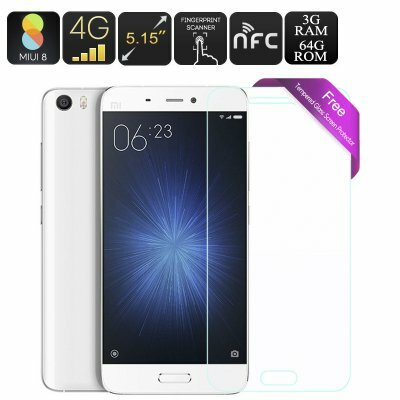 Successfully Added Xiaomi Mi 5 Smartphone 64GB - Snapdragon 820, 3GB RAM, 5.15 Inch FHD Display, Fingerprint Sensor, NFC, Android 6.0 OS (White) to your Shopping Cart. The Xiaomi Mi 5 is a beautifully crafted handset featuring a metal frame with front and rear glass, it's compatible to hold and has the hardware to match its stylish design ensuring it performs sublimely. Xiaomi's Mi 5 Smartphone is a flagship handset that ranks up there alongside big named brands but comes at a fraction of the price. With its powerful performance and elegant design, it is hard to believe it can be yours for just a snip under $400. A Qualcomm Snapdragon 820 processor and 3GB of RAM bring a devilishly fast performance while its high-end 16MP camera, quick charge technology, Fingerprint scanner and NFC ensures it can match flagship devices from leading brands. This next generation Smartphone really is one of the best phones of 2016. This 64GB storage version of the Xiaomi Mi 5 has plenty of space for all your media and games so the lack of a micro SD slot isn't of concern. A 5.15-inch screen crams in 428 pixels per inch to bring full HD resolutions, this bright colorful display is full of detail and easily viewable even on the brightest of days. A USB type C connector takes center place on the bottom of the handset and while this requires a different cable from many older USB devices you can benefit from faster speeds and rapid charging its also empowered with Quick Charge 3 technology. ON the rear of the Mi 5 is a 16MP camera so professional shots are well within your grasp. A fingerprint sensor is also present which leads to greater security and quick effortless access without the need for pin codes, passwords or screen patterns. Dual nano 4G SIM card slots let you manage two numbers on the Xiaomi Mi 5 smartphone so whether it is work or pleasure you can keep track of all your contacts and enjoy greater connectivity when traveling as multiple providers can be accessed on this one device. 4G network support also has the advantage of super-fast data connections so even without Wi-Fi connectivity you can stream high definition content direct to the phone without lag. Running on Xiaoim's very own Miui V7 operating platform will bring you all the Android 6.0 functions but wrapped in a unique user interface that's fully customizable and has some interesting features to make it more enjoyable and easier to use. The Xiaomi Mi5 Android Phone comes with a 12 months warranty, brought to you by the leader in electronic devices as well as wholesale smartphones and electronic gadgets..